A pretty summer top, but I think this pattern will need some adjustments for next time. I decided to treat this as a wearable muslin, but I spent my time sewing it carefully to get a good finish as I wanted to practice some shirtmaking skills for future projects. 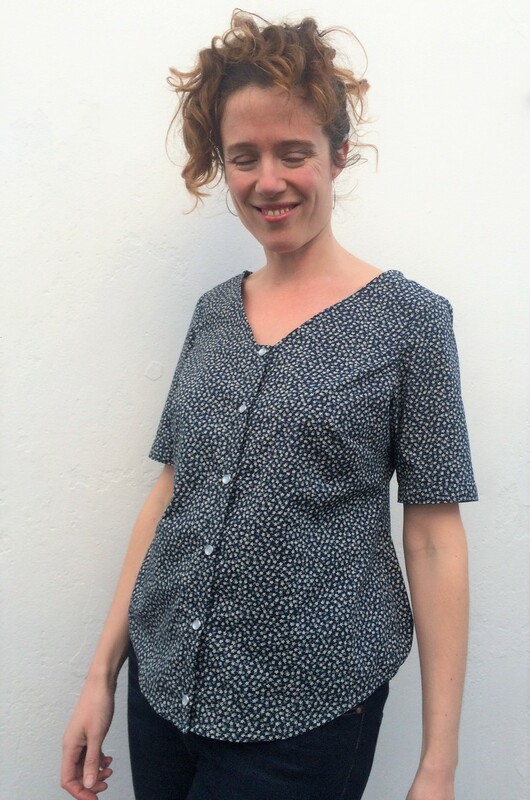 The Aster blouse, by Colette Patterns. 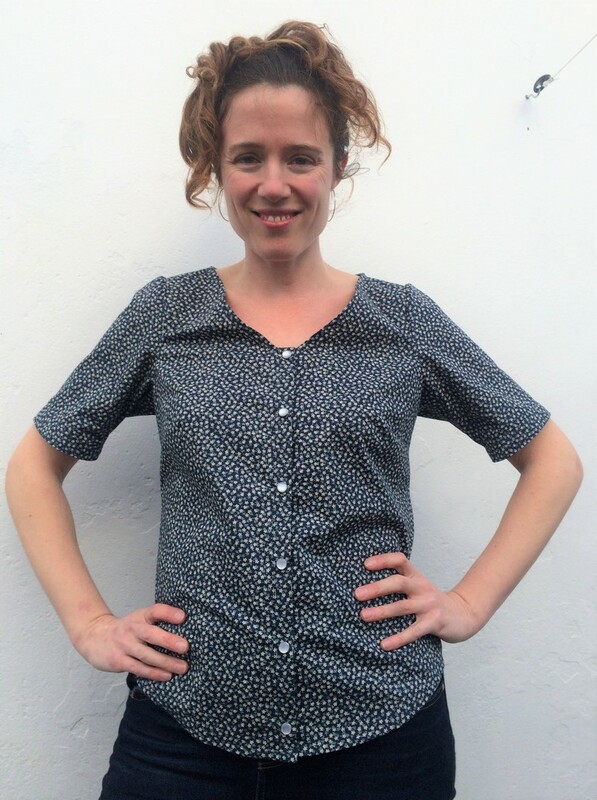 It’s a loose-fitting, V-necked blouse with a yoke, and I sewed View 1 with the short sleeves. My measurements put me between an 8 and 10, but I chose to cut the 8 with no grading as the pattern has lots of ease over the hips, and I know I have narrow shoulders so I figured I’d be better having the smaller size there. Some ditsy floral 100% cotton poplin from my local fabric store, Steve Bane Fabrics, in Frome. These are pretty much my ideal blues (navy with grey-blue flowers). 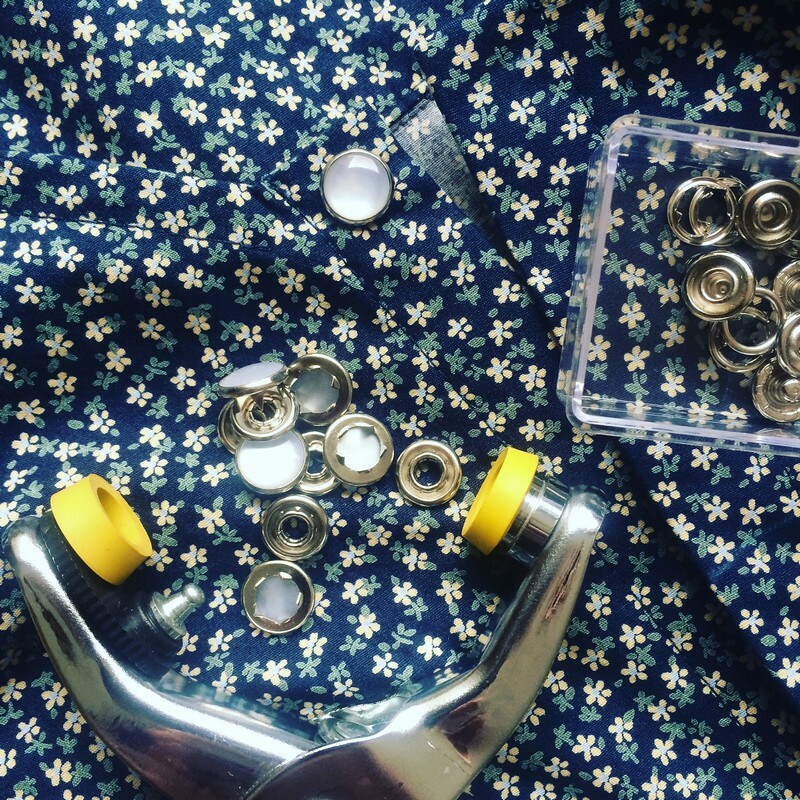 This was my first time ever making a shirt with a yoke, and I used the burrito method outlined in the instructions. It’s also the first time I’ve used three rows of easestitching on a sleeve cap, and it definitely made that easier to install so I’ll be doing this again in future. I swapped out the buttons for pearl snap fasteners. Easier to install and so cute! Made french seams on side and sleeve seams. 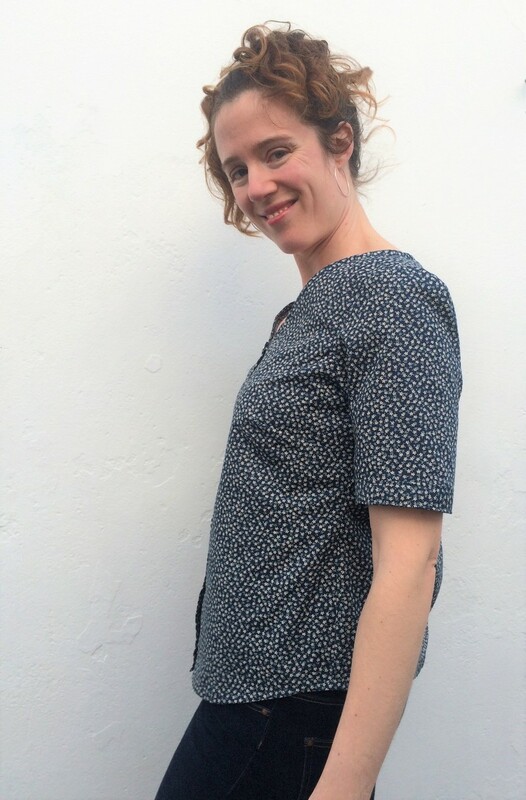 Cut 1/2″ rather than the 1/4″ bias the pattern specifies for finishing the neckline. I’m wondering if this is a mistake in the pattern (or misunderstanding on my part?) but I’m fairly sure that 1/4″ bias would have been too narrow to do the job it needed to do. Check out those gorgeous snaps! I’m definitely using these again in future. 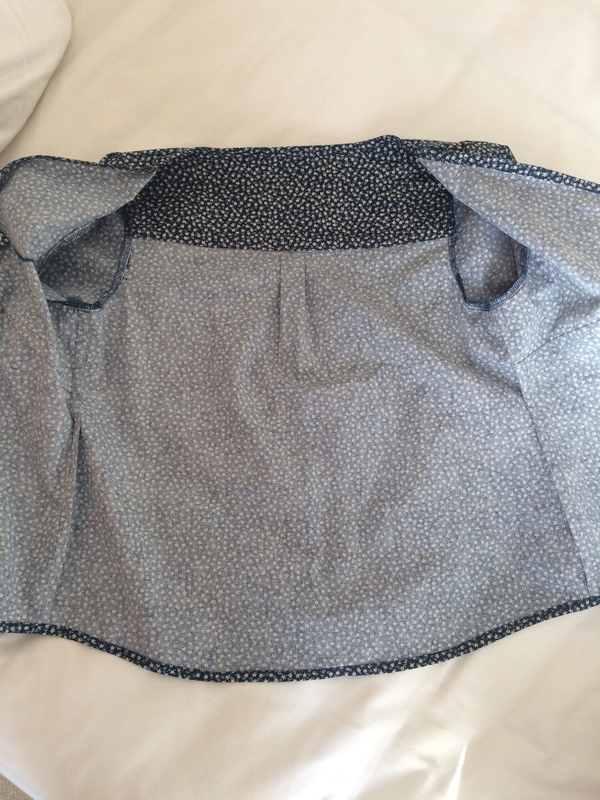 This was a pretty straightforward sew, even with the additional fussing I created by using french seams. I found the Colette instructions to be clear and easy to follow, with some handy suggestions for alterations. As I cut the front bodice pieces right on the selvedge (this fabric was printed right up to the selvedge) I didn’t worry about folding under the raw edge as there was no raw edge there, but aside from this and the alterations listed above I followed the instructions to the letter. The only possible pattern error I found was the placement of the seam alignment dot at the top of the sleeve. I think it might have been printed about an inch too far back as lining it up meant the sleeve head was only gathered in front of the shoulder seam. I just abandoned the idea of lining it up and distributed the easing evenly around the sleeve head. Look everyone, my guts are pretty! Hmm… There are things I really like about this top–it will be wonderfully cool in the heat of summer, and I love that deep v-neck. Also the fabric and the buttons are gorgeous. However, I don’t think it’s incredibly flattering. I’m used to tops that nip in at the waist, whereas this flares out from the bust. I can’t help but think that it not only doesn’t flatter my hips, but it makes me look completely flat-chested too! And it seems to have too much fabric billowing at the back too. This could be my swayback coming into play again, of course. I’m also not completely sold on the sleeve heads. I think there’s too much fabric there for my liking, making them stand up in a rather twee fashion. I’d rather have sleeves that can be sewn in flat. The most annoying thing as far as I’m concerned, though, is the way the neckline stands away from my body at the front–as is glaringly obvious in the above picture. I can see how this could be addressed with some flat pattern alterations (do I have a hollow upper chest?!) but I’m less sure how to go about sorting it out on this finished top. I’ve solved a similar issue with gaping sweetheart necklines by hand sewing some narrow twill tape just to the inside that’s a little shorter than the neckline, and gathering the neckline slightly to it. Perhaps a similar tactic would work here, although it would cover up that beautiful bias tape I made! I think the most important change would be to make it in a more drapey fabric. This poplin will hopefully soften a little with repeated washing, but some rayon content would definitely help it to drape in a more flattering way. 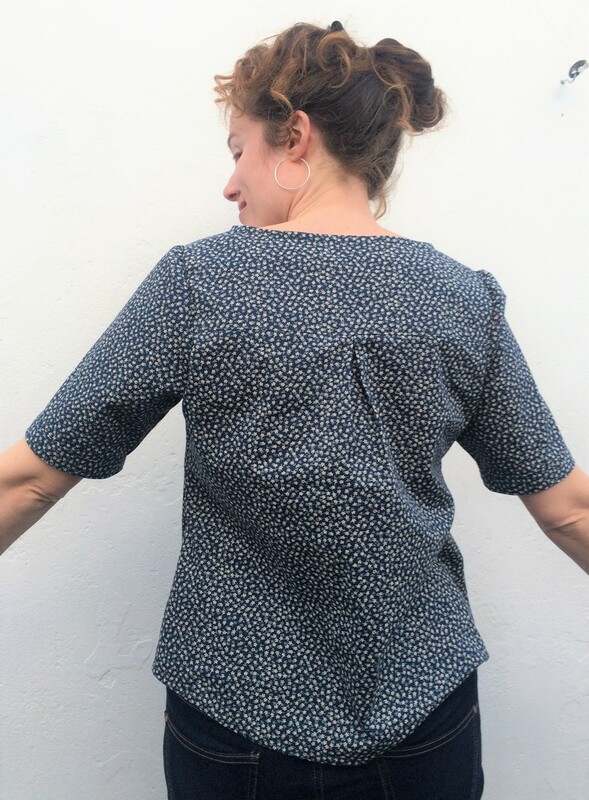 I can also possibly see me using this pattern as a jumping off point to create a more fitted summer blouse, with waist darts and perhaps narrowing the back bodice and eliminating the pleat. If I got the fit just right elsewhere then that could make the perfect summer top for me! Not exactly a bargain, but not too expensive when compared to a RTW blouse of similar quality.